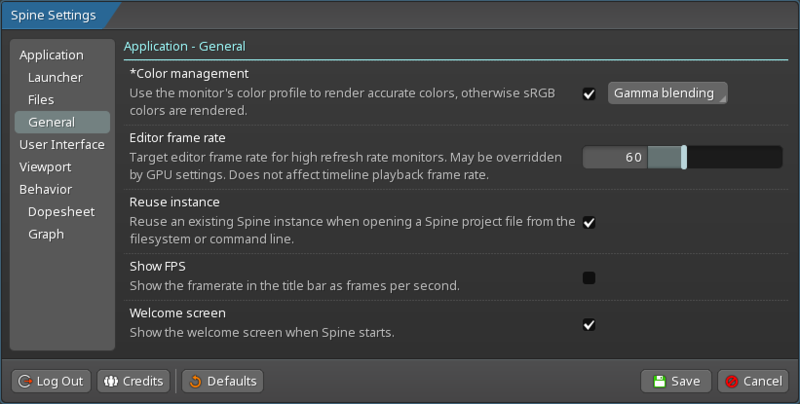 Spine provides many settings to customize a wide variety of features. To open the Settings dialog, press F12 or click the Spine logo in the upper left of Spine and choose Settings from the menu. The current Spine and Spine launcher versions are displayed here. 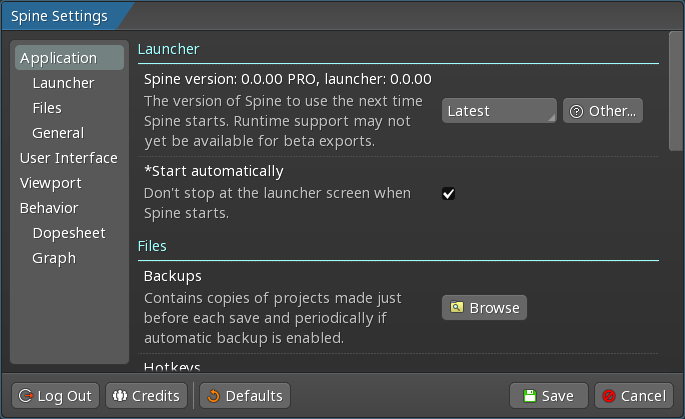 The select box specifies the exact version of Spine to use out of all the Spine updates you have downloaded in the past, or Latest which will cause Spine to prompt to download the latest version each time it starts. Click Other to specify a specific version by typing, in case you want an older version that you have not downloaded previously. See the changelog for a list of older versions. The default setting is Latest. If you are nearing a release of your application or you otherwise need to freeze the version of the editor, for example to match the runtime version you are using, then a specific version can be chosen. Projects saved with an old version of Spine can always be opened with any newer version. However, projects saved with a newer version of Spine cannot be opened with an older version. You are exporting images or video, so lacking runtime support doesn't matter to you at all. You want to try out new Spine features ASAP. You can always go back to a non-beta or any older Spine version, just be careful not to save your projects with a newer version since older Spine versions won't be able to open them. You know the runtime you are using has already been updated to work with the beta editor version. Some runtimes will be updated before others and we won't do a non-beta release until all runtimes are updated. Each runtime's README on GitHub specifies the most recent Spine version it works with. You want to animate with the latest version and are OK with waiting until the runtimes have been updated. This setting allows selecting the language of the Spine user interface. It is set by default to the system language, if available. Some languages cannot be used with the bitmap font, which renders most efficiently and supports only Latin, Greek, and Cyrillic characters, but is only available for medium and large font sizes. Other options are available for specific languages. The user interface font size. The bitmap font is limited to the medium size. Scaling of the interface is smoothed using linear filtering. Disabling with 200% interface scale may increase sharpness. Scales the entire user interface larger or smaller. Scales other than 100% or 200% may appear less sharp. When checked, Spine will show the welcome screen on startup, otherwise it will open the last opened project. These buttons open the corresponding folder when clicked. This folder contains copies of project files made just before each save and periodically if auto backup is enabled. This text file contains all of Spine's hotkeys. The file can be edited to customize the hotkeys to your liking. See key names for a list of the key names that can be used. This file is written each time Spine starts and often provides details when something goes wrong. When checked, the project will be saved periodically in the backup folder. For extremely large projects this may introduce unwanted pauses and can be disabled. When unchecked and you choose to delete an item, Spine will no longer ask if you really want to delete it. If an item is deleted accidentally, you can always use undo by pressing ctrl+Z (cmd+Z on Mac). Spine uses double click for a number of shortcuts, for example to rename an item in the tree. When unchecked, those shortcuts are disabled. This can be useful when using a tablet, where accidentally double clicking is very easy. When unchecked, Spine will not use animations in the user interface. This means menus will not be animated, dialogs will not fade in, etc. When checked, if a file is double-clicked it is opened in an existing Spine instance, if one is running. Otherwise, a new Spine instance is started to open the file. This setting is not available on Mac, where double-clicking a file always reuses an existing Spine instance if possible. When checked, scrollbars are animated smoothly when scrolled instead of jumping instantly into position. This setting allows customizing the toolbar position to maximize the usable editor space for your window size by placing the toolbar on the left, center, or right. The text labels can be hidden to take up less space. Automatic hides them when the toolbar no longer fits in the window. When unchecked, tooltips will not be shown by hovering the mouse. The tooltips can still be shown on demand by pressing F1. The amount in pixels to indent nodes in the tree view hierarchy can be changed with the slider to reduce or expand the amount of horizontal space taken. When checked, the mouse wheel or Zoom hotkey (U by default) will zoom in/out using the mouse cursor location. This is usually a very natural way of zooming, but may not work well for a pen tablet or touchpad/trackpad. When unchecked, zooming in/out uses the center of the editor area. The colors and pattern to use for the editor background. The dropdown menu allows choosing among various patterns. The first and second color determine the two pattern colors, while the third determines the gradient color. The slider sets the background scale. 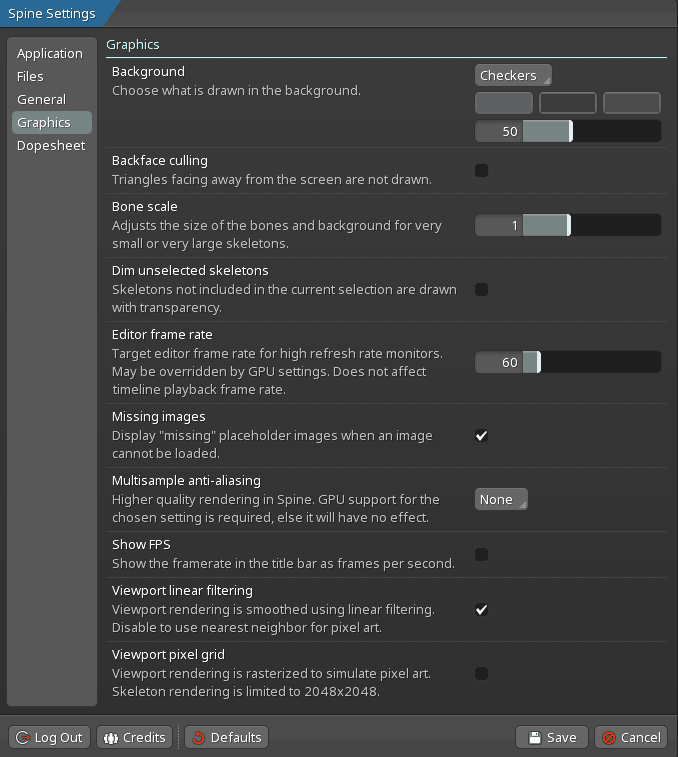 This setting can be enabled at runtime in a game toolkit, and it can be previewed in the editor by checking this option. When checked, the mesh triangles facing away from the screen are not drawn. This slider adjusts the size of the bones and background so they look better when working with very small or very large skeletons. 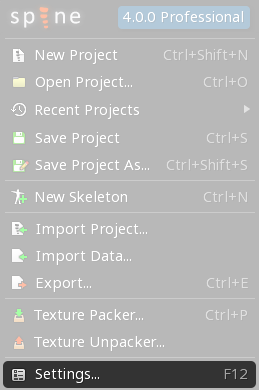 When checked and a project has multiple skeletons, skeletons that are not selected are drawn with translucency. This can reduce clutter if many skeletons are visible at once. Target editor frame rate for high refresh rate monitors. This setting may be overridden by GPU settings. It also does not affect timeline playback frame rate, unlike playback view. When checked, Spine displays missing placeholder images when an image cannot be loaded. When checked, Spine will use higher quality rendering. GPU support for the chosen MSAA setting is required, else it will have no effect. When checked, the framerate is shown in the title bar as frames per second. Note that Spine does not render all the time, only when the mouse moves, something is animated, or an animation is played back. When checked, the viewport rendering is smoothed using linear filtering. Disable this setting to use the nearest neighbor filter for pixel art instead. When checked, the viewport rendering is rasterized to simulate pixel art. But skeleton rendering is limited to 2048x2048. This slider sets the height of each row in the dopesheet. The default setting is the most visually appealing, but more rows can be shown at once with a smaller setting. When checked, the timeline position is set to the key's frame when a key is selected in the dopesheet. This can be unchecked if this behavior is bothersome.